Breakfast is the most important meal of the day; a phrase you've probably heard time and time again. Yet the lack of time, preparation or even appetite compels you to the skip the meal. Once and for all we're putting it to rest with 4 solid reasons that make breakfast the most important meal of the day and why you should never skip it. During the 6 to 8 hours when you sleep, your body doesn't receive any nutrition. When you wake up, eating breakfast is like breaking a fast; which is where it derives its name from. It gives your body nourishment with vitamins, minerals and more needed for healthy functioning. Ordinarily, you wouldn't go without a meal for 6 hours during the day which shows you how essential breakfast is for your body after a long stretch. If you're on a weight loss routine, you may think that skipping breakfast could help decrease your intake. However if you miss the meal, you may end up being even hungrier by lunch and eat unhealthy food or overeat to satiate yourself. Even if you manage to curb that, the habit can lead to inflammation within the body, according to an American Journal of Clinical Nutrition study in Time. Have you ever found yourself distracted, weak and unable to focus when your stomach is empty in the morning? When you skip breakfast, that's what happens. Whatever the activity, your body needs fuel to complete it. Breakfast provides that along with also aiding your mental focus and concentration. You may think that skipping breakfast will only make a difference to the current state of your body. What you do not know is, the habit can have an effect in the long term as well. 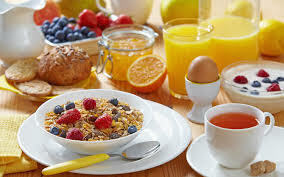 Over time breakfast can also reduce high blood pressure, heart disease and diabetes.